This is a simple surveying instrument, used to establish angles of 90 and 45 degrees when either setting out a site or taking linear measurements. However, it has unusual features that make it a rare object. 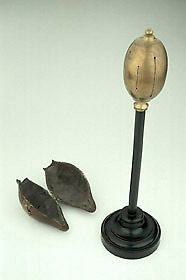 The egg shape to the top of the instrument is very rare, since a cylinder is the standard form and some later examples are octagonal. The survival of a wooden case shaped to match the egg is likewise extraordinary and exceptional.